Which college coach would you turn to when starting a team from scratch? Earlier today we talked about which coach in the history of college football you would want on your sidelines if you needed just one win. This afternoon, we return as TSS Associate Editors Bart Doan and Terry Johnson join Kevin Causey and rotating special guests in our weekly roundtables discussing all things college football. This afternoon we look further into head college football coaches but instead of opening it up to coaches from the past, let’s stay in the present as we are joined by special guest Carter Bryant, Sports Director/Host of 107.1 KELD in South Arkansas. Question: You are starting a college team from scratch, who’s your pick (current coach) to build this team from the bottom up? Meyer is the best offensive mind in college football. His speciality is the game’s most important position, quarterback, which would make the transition easier if I were to start a program from scratch. Meyer will always be remembered for his national championships at Florida and Ohio State, and rightfully so. The production at both schools in two completely difference conferences is astonishing. But the turnarounds he had at Bowling Green and Utah proves he can win and develop talent at all levels. The two names that pop to mind are Meyer and Nick Saban. While Saban is masterful in his own right, I will slightly favor Meyer simply because he is an offensive coach. College football heavily favors the offense and there are few, if any, as potent as offenses coached by Meyer. Meyer, for the most part, handles the media well and produces top 10 recruiting classes annually. Jim. Harbaugh. Which is pretty much what he’s doing, coming into a situation that needed a total culture overhaul, albeit with a roster stacked with highly recruited talent. But yeah, either way, Jim Harbaugh and #2 isn’t particularly close. Everywhere he’s been … from San Diego to Stanford to San Francisco … he’s been successful. Those are three drastically different levels. Twice he took the Toreros of San Diego to conference championships, the first in their program history before shuffling off to then moribund Stanford, limping around like they were an FCS team in an FBS program’s body. He immediately established credibility at a place known more for its academics than its football, even under the specter of Southern California’s dominance at the time over the college football landscape. After that, Harbaugh went to the NFL’s 49ers, where again, he immediately took a franchise that had been the equivalent of a drunk guy fumbling through his coat pockets for his house keys after being dropped off after an eight hour stint at the bar and took them to a division title and conference title game. After that, he led them to the Super Bowl and then another conference championship game. Even in spite of last season’s mediocre year, he spent four years in the pros and 75 percent of the time was either in the Super Bowl or in the game leading up to it. When you take over situations at multiple levels and have that style of success, it tells you that the guy can get anyone to buy in, and that’s mostly what coaching is. Harbaugh is adept at social media as well, only meaning that as we further transition into whatever this scary world will become, he seems equipped to take it by the horns and drag it around however it needs dragging. He’s also the perfect representative of your university: intelligent, passionate, well spoken, calculated, and honest. Jim. Harbaugh. And again, number two isn’t close. 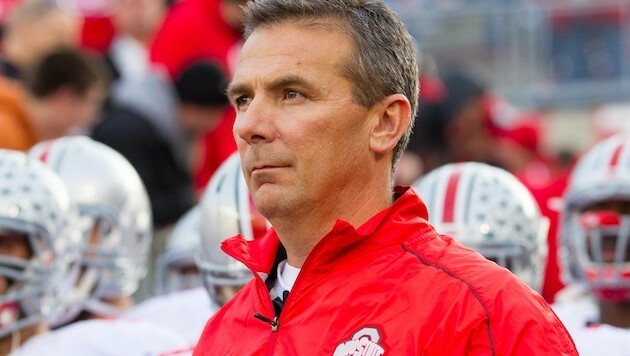 If I were starting a program from scratch, I’d pick Urban Meyer. I realize that this choice might raise a few eyebrows. After all, I wrote this morning that I’d select Lance Leipold to coach my team if I had just one game to play. So, why did I decide to go with Coach Meyer for this one? Simply put: Leipold has never had to start from scratch. He walked into a great situation at Wisconsin-Whitewater, inheriting a team that went to the Division III National Championship Game in 2005 and 2006. While he deserves all of the credit for guiding the Warhawks to six titles in eight years, we won’t know for certain whether he’s the right guy to rebuild a program (although his 109-6 record suggests that he is) until we see what he can do at Buffalo. On the other hand, there’s no doubt that Urban Meyer can turn a program around immediately. In his first-ever coaching gig, he took a 2-9 Bowling Green team and transformed it into an 8-3 squad that posted wins over Missouri, Northwestern, and Toledo, which won the MAC Championship that year (2001). Two years later, he inherited a consistently inconsistent Utah program, and guided it to a 13-1 conference record in Mountain West play over the next two seasons. Under his leadership, the Utes would become the original BCS Buster in 2004, demolishing Pittsburgh 35-7 in the Fiesta Bowl. He enjoyed the same success at the Power 5 level. After leaving Utah, Meyer helped Florida improve from 7-5 in 2004 to 9-3 in 2005. He engineered an even more dramatic turnaround at Ohio State in 2012, leading the Buckeyes to a 12-0 record following a paltry 6-7 mark the year before. Judging by his last three stops, there’s no reason to think that Meyer wouldn’t have my program in contention for a playoff spot in a few years. After all, he won the National Championship in his second year at Florida and his third year at Ohio State. It’s also possible that his 2004 Utah squad – the most underrated team in college football history – would have captured a spot in the College Football Playoff had it existed back then. Even if the Utes would have missed the field, the fact remains that Meyer has guided three different schools to Top 5 finishes by the end of his third year. That’s exactly the type of man I’d tap to lead my program. I understand the fascination with Urban Meyer and why two of three so far have picked him but when I’m building my franchise I’m looking for a guy who is in this for the long haul, and that might mean taking some lumps…which I don’t think Urban is willing to do at this point in his career. So I’m looking for a coach that values loyalty and comes from a background where he ran a difficult program for an extended period of time and had to maintain it despite not having all of the luxuries that major college programs have. The name that comes to mind right away for me is Chris Petersen. He didn’t build Boise State by himself but he was an instrumental part in their program history as he joined them as offensive coordinator the year that they entered the WAC and then as a head coach led them into the Mountain West. As a head coach, Petersen was 92-12 with Boise State and they weren’t just picking off nobody’s. They beat Arizona State, BYU, Georgia, Oklahoma, Oregon, Oregon State, TCU, Utah and Virginia Tech during his tenure. He has shown a pattern of being able to find the right recruit for his system, coaching them up and then watching them succeed no matter how bright the spotlight was. He’s also shown a pattern of being able to develop assistant coaches and replace them through succession planning when the time is right for them to go elsewhere. While his first year at Washington didn’t live up to expectations, Petersen is the guy I would want running my college football team if I had to build one starting from scratch today.